What I said three years ago bears repeating. Francesca's or even Twitter's CFO learned a lesson or two about tweeting. By any other name would smell as sweet; so Noise by any other name is still noise (sorry Mr. Shakespeare). CFO's need to communicate with those who need to hear what they have to say, and do it with more clarity than a 140 characters including some hash-tags. But then again, no one reads more than 140 characters these days, so it truly is a conundrum. It's less about putting out content and more about being able to be part of the conversation. Too many CFOs are not on Twitter and miss being able to listen in to what others may say about them, as well as being able to respond. 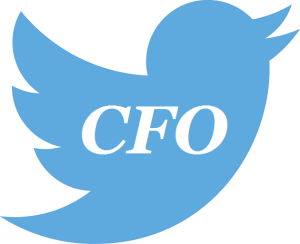 CFOs on Twitter, even if not active, have a branding advantage. I believe tweeting is very important. It helps establish your brand, i.e. what you offer any potential employer or client. However, what you disseminate must be thought provoking and worthwhile to draw someone to that 141st word (the Holy Grail of the decade). From my blog www.cfotips.com - in order of priority, referrers come from Search Engines (#1); Linked-in (#2); Proformative (#3); Wordpress (#4); buttons-for-website (#5); Facebook (#6); and then Twitter (#7). I believe few people of any position tweet because it is too easy to mis-tweet and go viral, losing your job. If I did not own my company, I would guard anything I say in public like every word were a top secret security breech. I act that way in everyday conversations, anyway. My attitude in tweeting is, most ideas that need to be conveyed need more than 140 characters. Anything less than 141 characters will amount to nothing more than a neanderthal grunt or a cheerleader chant; both of which have little effect.